With only two weeks remaining in the 2006 NCAA men’s soccer season, members of the Boca U23 team, including Brandon Schaefer from Stevens Tech, have all completed their season with several making a major impact for their respective schools during the regular season, conference tournaments and into the NCAA Championships. TOMS RIVER, NJ (November 23, 2006) – With only two weeks remaining in the 2006 NCAA men’s soccer season, members of the Jersey Shore Boca U23 team have all completed their college competition for the year with several making a major impact for their respective college squads during the regular season, conference tournaments and into the NCAA Championships. Sophomore midfielder Mark Schmiegel (Toms River) and Bucknell University (9-8-6) finished their 2006 magical campaign with a 4-0 loss to the University of Virginia in the second round of the NCAA Division I Tournament. The 2005 Toms River North graduate started in all 23 games for the Bison this year and tallied 2 goals and 1 assist, including the game winner in overtime against George Mason University in the tournament’s first round. Junior midfielder Andy Fraggos (Marlboro) helped Towson University to an overall record of 15-2-3 and one of the most successful seasons in school history. Towson lost 2-1 to Wake Forest University in the Sweet 16 round of the NCAA Division I Tournament. Fraggos played in 11 games off the bench for the Tigers this year. Seniors George and Nick Gkionis (Jackson), Brandon Schaefer (Albuquerque, NM), Chris McGreevy (Rochester Hills, MI) and junior Versh Tivzenda (Marietta, GA) helped Stevens Institute of Technology (18-0-3) advance to the NCAA Division III Sweet-16 Championship field playing NYU to a 1-1 tie before loosing 3-1 in penalty-kicks. This season, McGreevy started 20 of 21 games and tallied 10 goals and 8 assists while Nick Gkionis also started 20 of 21 games for the Ducks and tallied 9 goals and 8 assists. George Gkionis started 4 of the 16 games he played scoring 4 goals while adding 2 assists; Schaefer started in 15 of the 16 games he played this year recording 2 assists and Tivzenda played in 17 games while starting 5 for Stevens. Midfielders Justin McGrath (Brick) a junior and Teddy Niziolek (Clifton) a senior and Seton Hall (9-8-1) saw their 2006 season come to a close in the BIG EAST Tournament First Round following a 5-1 loss at South Florida. McGrath, a 2004 Monsignor Donovan graduate and Niziolek, a 2003 Clifton alum both started in all 18 games for the Pirates this year. Jon Curry-Edwards (Spring Lake Heights) a 2004 St. Rose graduate and the University of Delaware (6-8-2) men’s soccer team finished their season on a high note with a 3-2 victory over Colonial Athletic Association foe Drexel on Oct. 26. The junior goalkeeper who transferred from Old Dominion University, started in 7 games for the Blue Hens this year, allowed 10 goals for a 1.54 GAA and made 42 saves. Andrew Hawtin (Toms River) a senior defender at Syracuse University played in all 16 games for the Orange (7-8-1) this season while starting 14. 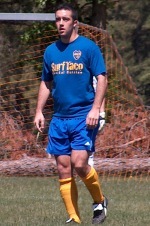 The 2003 Toms River East graduate and transfer from Ocean County College finished the season with two assists. Senior goalkeeper Chris Konopka (Toms River) led Providence College of the BIG EAST Conference to an overall record of 13-7-0 and their second consecutive trip to the NCAA Tournament before loosing to Hofstra University in the first round. Casey Zambor (Jackson – Monsignor Donovan) a senior defender at Lynchburg College netted 4 goals and tallied 2 assists placing him fourth on the team in scoring this year while starting in 13 of the 18 games he played for the Hornets (14-5-2). Andrew Perez (Brick – Brick Memorial) a junior forward at LaSalle University played in all 18 games for the Explorers (7-9-2) this year while starting 5 scoring one goal and adding 2 assist. Danny Haydu (Toms River – Toms River East) a junior defender at Monmouth University helped the Hawks (14-3-3) to their first ever NCAA DI Tournament appearance this year while playing in nine games. Mike Juska (Wall Township – Wall) a sophomore midfielder led Rider University (5-10-4) in scoring tallying 6 goals while adding 2 assists while starting in 18 games this year. This past summer, the Boca U23 team advanced to the semi-finals of the USASA U23 Regional Championship in Horsham, PA as well as the semi-finals of the MSSL Cup Championship in Lakewood, NJ. Jersey Shore Boca had over fifty-five club standouts who previously played for Boca on either their Men’s, Super Y-League, PDL, Club or Youth teams that participated in NCAA intercollegiate soccer this fall for their respective institutions either as coaches or players. This is one of the highest numbers of Jersey Shore Boca players to ever participate in NCAA intercollegiate soccer during the same season in the club’s 28 year history. The Club is celebrating their 28-year anniversary in 2005.